There may be no magic pill for weight loss, but dietician Julie Upton, MS, RD, of Appetite for Health stays on top of the science behind taming your appetite naturally. Here, she deciphers recent research and shares six foods that will keep your appetite in check. Several new studies have identified compounds in certain foods that trigger the release of hormones in the stomach that help you feel full and neurotransmitters in the brain that suppress appetite and reduce cravings. Eating more of these foods can help keep your hunger in check, even as you cut calories to peel off pounds. It's a weight loss win-win! 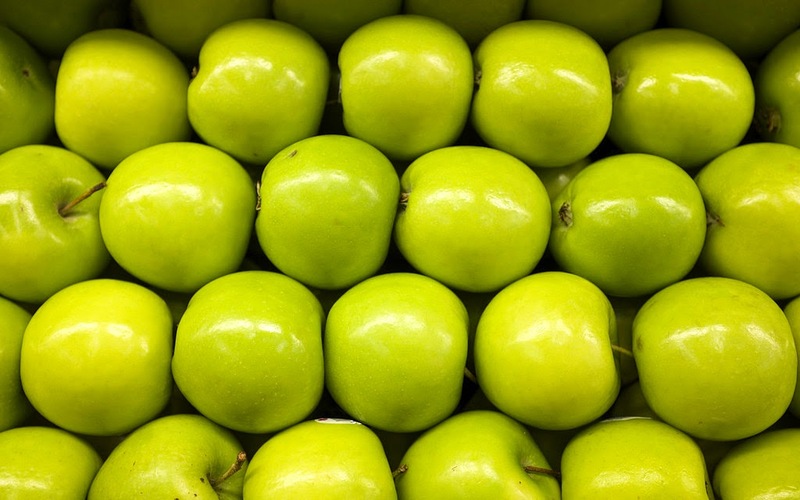 An apple a day may keep extra pounds away, according to research that shows this fruit contains filling soluble fiber as well as ursolic acid, a natural compound that has been found to boost fat-burning and may promote lean muscle mass. In one study, researchers from the University of Iowa note that animals given ursolic acid supplements increased their muscle mass and energy expenditure (or calorie burn). And a study that was done on people and published in the journal Appetite shows that women who added three small apples (total calorie cost: 200) to their diet per day lost a little more than two pounds in 10 weeks — more than dieters who did not include the fruit in their diet. A medium apple has 95 calories and 6 grams of fiber; a small apple has 75 calories and 3.5 grams of fiber. Be sure to eat the whole apple, as the ursolic acid as well as beneficial antioxidants are concentrated in the skin. Beans, peas, lentils, and chickpeas are a triple threat against hunger because they contain a lot of fiber; are excellent sources of slow-to-digest protein; and have a low glycemic index to keep blood sugar and carbohydrate cravings in check. A recent meta-analysis published in the journal Obesity indicates that people who ate about one cup (5.5 ounces) of legumes felt 31 percent fuller than those who didn't eat these fiber-filled foods. Another study, published recently in the Journal of Human Nutrition and Dietetics, reports that overweight people who ate a bean-rich diet lost nearly 10 pounds in 16 weeks while simultaneously improving their blood cholesterol levels. Here's some egg-citing news: eating a breakfast that's rich in protein (20 to 30 grams) suppresses ghrelin, a hormone that stimulates your appetite, while elevating peptide YY and GLP-1, two hormones that enhance satiety, according to research. One study in the European Journal of Clinical Nutrition suggests that when subjects ate eggs for breakfast (versus equal-calorie breakfasts of either cereal or croissants), they consumed up to 438 fewer calories over the entire day. Need a reason to go Greek? A landmark study, published in Nutrition, Metabolism & Cardiovascular Diseases, reports that among more than 8,500 European adults, those who enjoyed a serving or more of European-style yogurt every day (either low-fat or full fat but with less added sugars compared to US varieties) were 20 percent less likely to become overweight and 38 percent less likely to become obese during the six-year follow-up compared to those who ate less than two servings of yogurt each week. How could thick and creamy Greek yogurt whittle your middle? The researchers believe that the protein, calcium, and probiotics may all play a role. Plain Greek yogurt is your best bet because it's strained to lose the watery whey and some of the natural sugars. It has roughly twice the protein as traditional yogurt (a cup of plain Greek yogurt packs 24 grams of protein, as much as four large eggs) and half the sugar (with only about eight to nine grams of natural dairy sugars and no added sugar). Mangos are not only delicious, they're also diet-friendly. A study in The Journal of Nutrition and Food Sciences suggests that mango-eaters weighed less and had better diets than those who missed out on mangoes. This stone fruit contains many bioactive ingredients, including mangiferin, a compound that has been shown in preliminary research to help reduce body fat and control blood sugar levels. Research published in the British Journal of Nutrition reports that mango added to the diets of rodents prevented weight gain and improved blood sugar and insulin levels when the animals were fed a high-fat diet to promote weight gain. A cup of sliced mango has just 100 calories and 3 grams of filling fiber. Say mmm, mango! Go ahead, get a little nutty! Despite being high in calories (160 to 170 calories per ounce), nuts can be very slimming. Studies show that nut lovers are thinner than those who avoid or rarely eat nuts. Why? Nuts keep you fuller longer; their calories aren't fully absorbed by the body, and nuts provide a modest boost to your metabolism, according to research. In-shell pistachios provide a unique advantage for waistline-watchers. A preliminary study from Eastern Illinois University suggests that people who snacked on in-shell pistachios consumed 41 percent fewer calories than those who ate shelled pistachios. The authors say the empty shells might be a helpful visual cue about how much has been eaten, thereby encouraging you to eat less.